A fast, easy way to add beauty and value to your property. 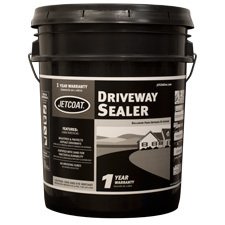 This driveway sealer is ideal for light traffic areas. KWIK KOTE Asphalt Emulsion Driveway Sealer is packaged ready to use. Stir sealer to a uniform consistency and continue to stir throughout application. With pavement still damp, apply a uniform coat of sealer, being sure to avoid heavy or uneven application which may result in cracking or tracking. A second coat should be applied after the first coat has dried “to the touch” or within 24 hours at stated coverage rate. A rubber squeegee or brush is recommended for application. Depending on pavement porosity, coverage will vary from 250-350 sq. ft. per pail. CALIFORNIA PROPOSITION 65 CHEMICAL WARNING: This product contains chemicals known to the state of California to cause cancer. A rubber squeegee or brush is recommended for application. 25705 4.75 gal. Pail 54.6 lbs.